It is such an honor to serve as your new District Superintendent. I want to thank you for your encouragement and prayers as we begin this journey. Many of you have let me know that you are giving God your yes to advance on this path together. The Metro District of the C&MA is a Christ-Centered Acts 1:8 collaborative movement of multi-cultural and multi-generational churches focused on Kingdom renewal in Metropolitan New York and all of New Jersey, including a mandate for the cities, impacting everywhere with the Gospel in a transformative, holistic manner. Fulfilling this mission will require intentional collaboration. We will be collaborating to see kingdom renewal in our churches, our cities reached, and holistic gospel transformation spread throughout our district. An African proverb says, “If you want to go fast - go alone, but if you want to go far - go together.” Advancing together, I believe we can go farther than we have ever gone before. Led by the spirit and working collaboratively within strategic teams, I envision great things for our district. I believe we can see at least 80% of our churches growing, thriving, and reproducing new churches. Let’s raise up and release 100 international workers fully supported by our district and engage in local outreach with the people groups living among us. We can offer the transforming power of the gospel as we serve with biblical justice and mercy to the marginalized and disenfranchised of our societies. Strategically positioned around New York City, Philadelphia and the numerous towns in between, I know we can plant 100 new churches who are advancing the gospel presence throughout our communities. Finally, we will join with God to prepare every official worker to lead with a healthy soul, empowered by the spirit, and being developed into effective kingdom leaders. Each of these objectives will be carried out within strategic teams led by District Staff, as well as a central team of Operations, Administration and Development who will efficiently and effectively support the mission of the district. ENGAGE: The Engage Team will mobilize the local church for global engagement through international partnerships and within local people groups. ADVANCE: The Advance Team will foster church multiplication through training, assessment and strategic advisement for plants, multi-sites, campuses and re-developments, including a special emphasis on our cities. LEAD: The Lead Team will develop spirit led leaders through licensing, ordination/consecration and ongoing development, who will impact our region with the Gospel in a transformative holistic manner. GROW: The Grow Team will train and inspire the local church to fulfill its mission with healthy foundations for effective ministry and Kingdom renewal. This is a big vision. It’s a God-sized vision, that requires a new model of ministry. The regional model we currently have served us well for many years, but we are moving in a direction that calls for a new strategy. This means, moving forward, we will no longer have Regional Team Leaders as that position is not part of our new organizational structure. I am so grateful for Yeathus Johnson, David Janssen, and Bob Riconda who have served us over the past 15 years. As a pastor in the district, I benefited greatly from their service to our church and I want to thank them for their sacrificial love, care, and commitment to the District. I have wrestled with the significance and implications of this new model, but through prayer, conversations with national leadership and with the affirmation of Dexcom, this is the way forward that I believe God has laid out for us. 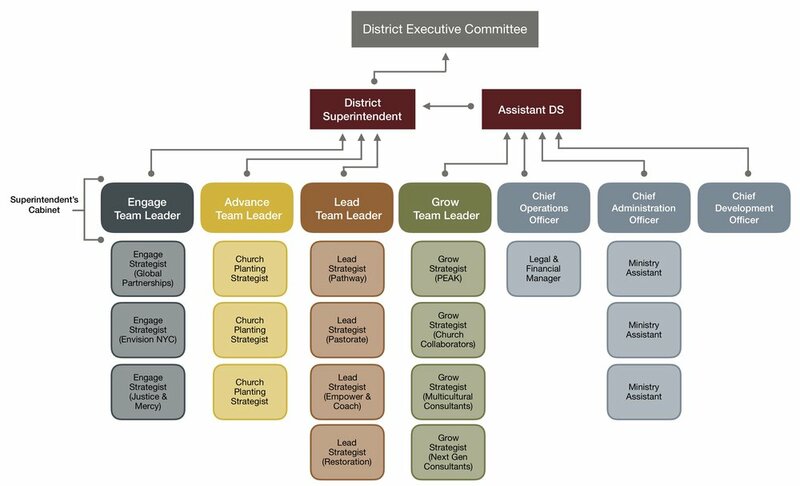 Below this letter you will find a draft of the organizational chart that will comprise the new District Leadership. Naturally, you are going to want to know who the district leadership team will be. All of that is starting to unfold and within the next few weeks you will receive notifications from me as each of those positions are filled. In addition, I would like to invite you to join district leadership at one of several Vision Gatherings held at various churches around our district. Friends, we have never walked this way before. And a new way of walking means change. In times of change, there is loss and gain, pain and anticipation, yet as we move forward I want us to hold on to who we are together: We are Spirit-filled, renewal seeking, Bible teaching, healing believing, gospel proclaiming, risk takers who learned from our founder that people who advance the Kingdom are presence dwellers who say ‘yes’ to Jesus with uncompromised obedience – even if they’re called to walk a way they’ve never been before.